Think Maine... Think Coast... 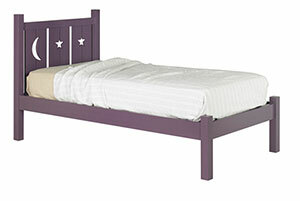 Think Summer... A quintessential cottage bed for kids, conjuring images of tents and s'mores. Sleep under the moon and stars every night with this graphic headboard. Campfire Twin Bed shown in Mussel. Available in Twin, Full, Queen, King and custom sizes.